The next issue of The Shakespeare Oxford Newsletter, published by the Shakespeare Oxford Society, will feature Spring Books. Anyone who would like to review a book or offer more generalized comments about the recent spate of books/movies concerning the Authorship Question (from Contested Will to Anonymous) is invited to contact the newsletter editor, drmichaelegan@omcast.net. Reviews and review-articles should be about 1000 words, negotiable each way. YORKTOWN HEIGHTS, NY – June 7, 2010 – The Shakespeare Oxford Society (SOS) has announced the appointment of Professor Michael Egan, a Shakespeare scholar who is open-minded on the Shakespeare authorship question, to be the editor of the Society’s quarterly newsletter. With M.A. and PhD degrees from the University of Cambridge, Professor Egan is an internationally known writer, consultant and educator. Professor Egan will continue in his role as editor of The Oxfordian, the Shakespeare Oxford Society’s flagship annual scholarly publication. There is a long and distinguished history of doubting the traditional “Stratfordian” attribution of the Shakespeare works. Noted doubters over the years include Mark Twain, Walt Whitman, Henry James, Sigmund Freud, and Charlie Chaplin. More recent skeptics include renowned Shakespearean actors Sir Derek Jacobi, Jeremy Irons, Michael York, and Mark Rylance. Last year, the Shakespeare Oxford Society and the Shakespeare Fellowship jointly presented the 2009 “Oxfordian of the Year Award” to John Paul Stevens, Associate Justice of the United States Supreme Court. Justice Stevens has long doubted whether William Shakespeare of Stratford-on-Avon is the real Bard. The BBC published a story about the case for Edward de Vere as the real Shakespeare. (See BBC News: The Earl of Oxford’s Big Secret. Michael Egan is an internationally known writer, consultant and educator, with experience working in England, South Africa, the US mainland and Hawaii. Formerly Scholar in Residence, Brigham Young University-Hawaii, Egan earned his BA from Witwatersrand University, and his M.A. and PhD degrees from Cambridge. He has served as Professor of English at the University of Massachusetts, Amherst, Lecturer in English, Lancaster University, UK. and as Visiting Professor at the University of Hawaii, Hawaii Pacific University, and South London University. He is a prize-winning author of ten books and over 80 professional articles. Founded in 1957, New York-based Shakespeare Oxford Society is a nonprofit, educational organization dedicated to exploring the Shakespeare authorship question and researching the evidence that Edward de Vere, the 17th Earl of Oxford (1550 – 1604) is the true author of the poems and plays of “William Shakespeare. The homepage of the Society also says the group is “Dedicated to Researching and Honoring the True Bard.” Visit www.shakespeare-oxford.com for more information. A feature article about Amelia Bassano Lanier as the author of Shakespeare’s works — “Was Shakespeare a Woman?” by Michael Posner — appeared in the Toronto newspaper Globe & Mail on January 15/16. The journal is identified as The Oxfordian edited by Michael Egan, although the reporter misidentifies The Oxfordian publisher — the Shakespeare Oxford Society — as the “Oxford Society”. In order to understand the research it is necessary to read the article in The Oxfordian titled ‘Amelia Bassano Lanier; A New Paradigm’. It is available on the Dark Lady Players web site http://www.darkladyplayers.com on the page for the Theater Practice. If anyone cares to read the article and has a substantive point to make I will be happy to respond to it. A sidebar to the article lists and describes the major contenders in the Shakespearean authorship question: Oxford, Marlowe, Bacon and Derby; and cites London-based The Shakespearean Authorship Trust as one of the resources for the information. The Shakespeare Oxford Society’s The Oxfordian editor, Dr. Michael Egan, will edit a new collected works of Shakespeare from the authorship perspective to be published by Edwin Mellen Press — a self-described, non-subsidy publisher of scholarly books headquartered in Lewistown, New York. Egan intends the edition for colleges and teachers who are interested in teaching Shakespeare from reliable texts and in pursuing the authorship question. He said the work may eventually include multiple volumes. Submissions may be sent to Michael Egan at <mailto:drmichaelegan@comcast.net>, or 2121 Southern Star Loop, Las Cruces NM 88011. The Shakespeare Oxford Society recently mailed this year’s The Oxfordian (Volume 11) — the first volume edited by recently appointed editor Michael Egan (PhD), an award-winning Shakespeare scholar who is open-minded on the Shakespeare authorship question. New York-based Shakespeare Oxford Society is an educational organization dedicated to exploring the Shakespeare authorship question and researching the evidence that Edward de Vere, the 17th Earl of Oxford (1550 – 1604) is the true author of the poems and plays of William Shakespeare. We’re delighted that a Shakespeare scholar of Professor Egan’s stature agreed to join us as the editor of our flagship annual publication. We invite other Shakespeare scholars and Bard lovers worldwide to take a look at this year’s edition of The Oxfordian and to approach the authorship issue with an open mind. It’s a fascinating topic that deserves the serious attention of scholars and the media. 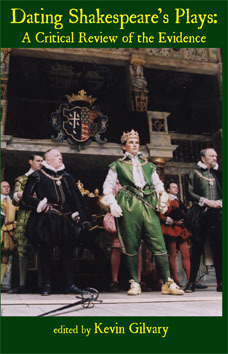 The BBC recently published a story (November 27, 2009) about the case for Edward de Vere as the real Shakespeare. See BBC Oxford: Edward de Vere: The Bard or not the Bard by Dave Gilyeat. One of the most disturbing aspects of the whole debate is the way the anti-Stratfordians are silenced. There isn’t any real attempt to confront the arguments. There’s just a general mocking and ridiculing strategy — what I call arguing by adjective… ‘ridiculous, absurd’ and so on… whereas in fact there’s some very suggestive and interesting pieces of information that need to be factored in there. It’s a little like the Copernican theory of the universe. What seems obvious at first turns out to be not so when you try to reconcile the obvious with the anomalies and the anomalies are great. The 2009 edition of The Oxfordian features an Open Forum section with articles supporting five different authorship candidates: David Kathman on William of Stratford-upon-Avon; Peter Farey on Christopher Marlowe; John Hudson on Amelia Bassano Lanier; John Raithel on William Stanley, and Ramon Jimenez on Edward de Vere, the seventeenth Earl of Oxford. · Frank Davis: Greene’s Groatsworth of Witte: Shakespeare’s Biography? · John Shahan and Richard Whalen: Auditing the Stylometricians: Elliott, Valenza and the Claremont Shakespeare Authorship Clinic. If the traditional ‘Shakespeare’ did not write the plays ascribed to him, who did? On this matter I am not settled. I have a lot of sympathy for the Oxfordian response, but frankly my mind remains open. I believe all scholars worthy of the name should allow the research to take us wherever it leads, and that’s exactly how I intend to operate as editor of The Oxfordian. Michael Egan is an internationally known writer, consultant and educator with experience working in England, South Africa, and the US. Egan earned his BA from Witwatersrand University, and his MA and PhD from Cambridge. He has served as Professor of English at the University of Massachusetts, Amherst, Lecturer in English, Lancaster University, UK. and as Visiting Professor at the University of Hawaii, Hawaii Pacific University, and South London University. He is a prize-winning author of ten books and over 80 professional articles. SOS Oxfordian editor Michael Egan requested advertisements in this year’s publication due out in November. Anyone who has an ad to run for conferences, books, or other items relating to Shakespearean authorship may submit an ad that will run free of charge in this year’s annual Shakespeare-Oxford Society journal.